"Contemporary Impressionism with a focus on abstractly deconstructing images in a broken color style, creating new aesthetic experiences of place and landscape." Brooke is a full time award winning artist, working out of Capitol Hill Seattle. Her paintings- either created indoor or on site- focus on innovation, aesthetics, place and perception. 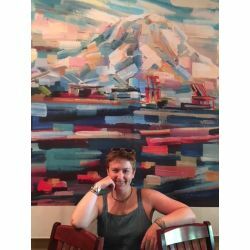 With a background in plein air (on site) landscape painting, she has gained an intuitive affinity for color and dynamic composition and developed an analytical way of breaking up a scene into blocks of color. r iaudience to enjoy getting lost in. Over the past 8 years as an exhibiting artist Brooke has most recently been awarded a prestigious prize for best oil/acrylic painting at the 2018 Carmel Plein Air Competition. She is nationally and internationally collected and shows at galleries in 6 different states- Washington, California, Oregon, Utah, Colorado and Maine. When Brooke is not making art you can find her at one of Seattle’s many niche locations competing at pinball tournaments.